Eat a well-balanced, low fat, healthful, varied, wholegrain, plant-based diet with as much organic produce as you can afford to ensure that you are getting the proper balance of vitamins, minerals and nutrients. Make sure you exercise regularly including weight-bearing exercises such as walking, dancing or hiking. Go out into nature as much as you can – whether it’s hiking, swimming or just feeling the grass underneath your feet. Drink enough water. If you add fresh lemon this help with water absorption, detoxification and stimulation of your metabolism. Ensure you get adequate rest and listen to your body. If you’re tired, sleep. Don’t become addicted to fast foods, deep-fried foods, fats, sugars, refined products, caffeine, tobacco, drugs or alcohol – all of these products leech out essential vitamins and minerals from your diet plus will add years to your age. Don’t get involved in drama or hang around negative people. Surround yourself with true friends and positive people who are on the same life path as you. Spend time with people whose company you actually like and don’t hang around with people who stress you out or complain every time you see them. Appreciate and be thankful for everything you have in your life: your family, friends, health and the planet. Everything that exists around you, you have created. See the wonder in everything. 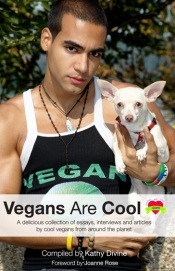 You can purchase Kathy Divine's Vegans are Cool book online and download the free PDF version HERE. See Kathy's previous book, Forever 21.